I found this restaurant as I was walking through Soho with my mother one night, looking for a place to eat.. and that's how we found Bill's. It's a new branch of a larger chain but I had never heard of it before. This restaurant attracted us because it was very busy inside, and it looked like a very cosy place for dinner. iPhone quality/bad lighting... at least it was good! There are other branches accross the UK, check it out. A one-page menu, just how I like it. Quite a large range of options though, from all kinds of bread, to avocado and bacon salad, to piri-piri chicken, to a hamburger and even a classic Belgian dish 'moules frites'. I think everyone will find something they like here. I opted for the Bill's burger with fries and a french pink soda. My mother chose the halloumi and hummus burger, which weirdly also came with fries. 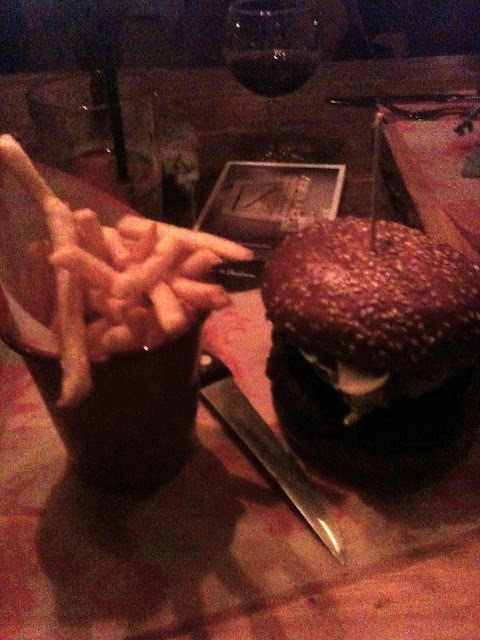 The burger was great, I'd say just as good as my favorite burger place in London, Byron Burger. I really liked the atmosphere at Bill's, partly because of the romantic candlelight, partly because of the cosy ambiance. The dim lighting was a big plus, I hate harsh lighting. Because we had no reservation, and it was very busy, we were seated on a big table with another couple, but I barely even noticed them sitting there. However, if you like to have your own table, just make a reservation in advance. Prices are reasonable. I'd say mid-pricing. All main dishes range from 9.95 to 15.95, which is a normal price for your typical London chain restaurant. The extra topping for the burger were a bit pricey though, so it refrained me from taking any, but this is just a little thing I noticed. Overall I had a nice evening at Bill's. I would go back again because the staff was very friendly and attentive, the food arrived extremely fast and the atmosphere was great and cosy. It's a place I would go to with friends for casual brunch/lunch/dinner, but not on a date or business lunch because it's too casual/noisy. Similar restaurants: Cote and Giraffe. But Bill's is definitely a bit better.